Reliability – that comforting feeling when you know something will just work; free of stress, free of hassle, free of worry. Everyone loves that feeling, so here at Podbean we’ve been working on a new, more reliable way for you to upload files to your account. We’ve implemented an FTP Upload function for all users, to improve the upload experience for those of you that desire it. Reliability – your files are more likely to upload successfully. Multiple uploads – you can upload multiple files at the same time. Resumable uploads – if your internet connection drops, or your computer freezes during uploading, it’s not a disaster! You can start off where you left off once you get everything sorted. We hope this makes uploading more convenient for you. If you have any feedback on this feature then feel free to get in touch! Podbean gives podcasters the ultimate power to gain new listeners through search engine optimization; an editable permalink. With this new feature Podbean is changing the way its podcasters can find and attract listeners. This easy-to-use function allows users to customize the link of each episode, generating more new listeners through internet searches. With a few simple clicks you can become as SEO master and podcast success! Head to Podbean news right now to learn more about this and all the new features that make podcasting easy. Remember the days before smartphones and feature phones, when texting was exciting new technology and your favourite (only) “app” was Snake? As smartphones become ubiquitous and mobile computing becomes the norm, more and more people are doing more and more on the go. Why not, then, stream podcasts on the go too? 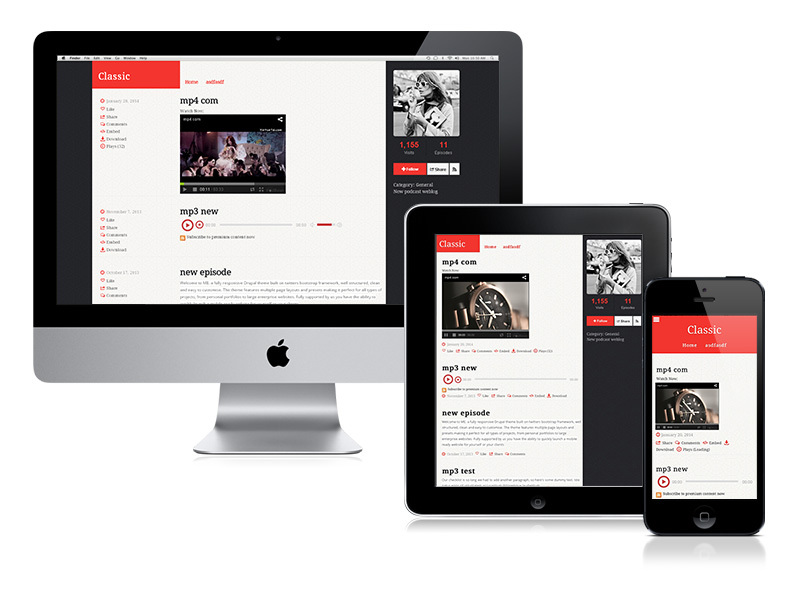 With Podbean’s new responsive templates, you can! We’ve introduced 3 new responsive templates that not only have great functionality, but look great too. Because these templates are responsive, they will stretch and squeeze to fit any screen whether it be on a computer, tablet or smartphone. This makes all the content much more convenient to access and use especially on mobile devices. On top of this each of the 3 new templates is beautifully designed to look modern, fresh and clean to give your podcast the stylish look it deserves. Our responsive templates are available to all our Professional and above plan members – why not go and have a look at them right now?